Curious about using native plants in your Baltimore landscape? On Monday, September 26th, I’m presenting at Roland Park Country School on that very topic as part of their “Kaleidoscope” adult education series. The title of the presentation is “NATIVE PLANTS FOR ROLAND PARK LANDSCAPES” but the information will be just as useful to residential gardeners around the area as to those in Roland Park specifically. Anise-scented goldenrod blooming in Roland Park. I will discuss the use of native plants by the Olmsted Brothers and other turn-of-the-century designers, with a focus on identifying plants that can be used by modern Baltimore residents to beautify their landscape and benefit the ecological health of the neighborhood. The presentation will cover a variety of topics, from wildlife value to aesthetics, so that everyone should be able to take away something from the evening. There will also be handouts that will guide homeowners on ideas for plants as well as local sources for them. Many residents want to have a healthier yard, but are overwhelmed with the choices available to them. One of my main goals is to make the process easier, so that people realize that they can have gardens that look beautiful and also support plenty of wildlife. Having a home surrounded not only by lovely plants but also butterflies, birds, fireflies, and the like is something that most people can agree is a rewarding goal. There is a $15 fee for this presentation, and you can register by mail or by phoning (410) 323-5500 x 3045. It’s not too late to register and there were still some spaces available the last time I checked. For the full run-down of Kaleidoscope courses you can download a PDF version of the Fall 2011 Catalog by clicking here. Continuing the trend of highlighting some of the great native plants which appear in a 1913 Olmsted Brothers planting plan. 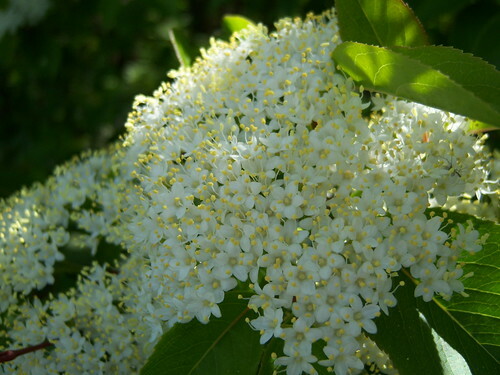 for Roland Park, I want to turn particular attention to Viburnum prunifolium, or blackhaw viburnum. This is a tall, upright and somewhat slender shrub or small tree. It can reach heights of 10’ to 12’ and a spread of 6’ to 8’. In Roland Park it is the perfect size to play the lead role in a privacy screen, but it could just as easily be the background for a mixed bed. It does well in sun or part shade. 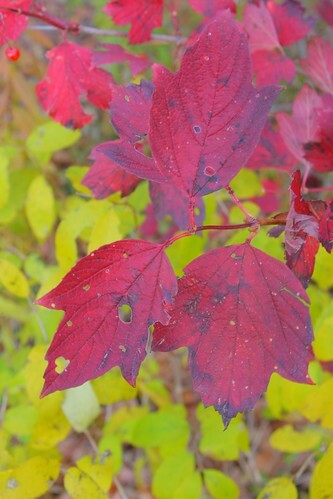 Viburnum prunifolium has multiple seasons of interest. The spring blossoms are attractively creamy, the fruit is an attractive bluish-purple, and the fall foliage is a stunningly gorgeous crimson red. This is a great shrub to add to your landscape if you like having birds, butterflies, and other pollinators around. The birds love the fruit, it is a larval host for many butterflies, and our native bees relish its flowers. Viburnum prunifolium is very much underused, especially relative to the more common native Viburnum dentatum (e.g. Blue Muffin viburnum) and the non-native Asian viburnums. Being so beautiful and so easy to grow, it deserves a spot on your yard.